It used to be inside information for New York natives only: the night before the Macy's Thanksgiving Day Parade, the giant helium balloons are inflated and prepared on the Upper West Side. Over the years, it's become a public event in its own right, and this year Police Commissioner Logan Donovan and his daughter, Allie, are on hand for the festivities. As Commissioner Logan addresses the happy crowd, a shot rings out—and when the panic ends, Allie is missing. Someone has kidnapped her, and her freedom will come at a high cost. The parade begins at 9:00 Thanksgiving morning. FBI Special Agent Eve Rossi and her Vidocq Team, a group of uniquely skilled convicted criminals with oversized egos and contempt for the rules, have only hours to find Allie, her kidnapper, and the second child they learn the kidnapper's holding. Allie's father, Commissioner Logan, should be their most powerful ally—but he has secrets of his own to protect, secrets that may have made his own daughter a madman's target. "[A]nother stellar case . . . Elements of a ticking clock mixed with the authentic feel of New York City make this a gripping and terrifying story. Rossi and her team are unique." City on Edge "takes the thriller motif of the ticking clock and inflates it with helium." 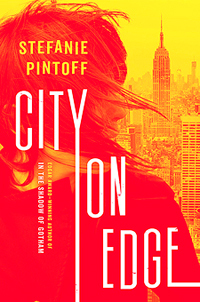 City on Edge is "a taut, clever tale that skillfully balances high-stakes danger and a sprawling setting with insightful personal details and intimate—and deadly—secrets." "In this high adrenaline cat and mouse crime thriller, you will constantly wonder who the good guys actually are . . . Stefanie Pintoff has written a blistering-paced thriller that will have you reading late into the night and leave you guessing until the very end." "[A]n interesting protagonist with a strong supporting cast . . . the novel is loaded with suspense, and the interplay and repartee among the sharp-elbowed members of the Vidocq team add another layer of realism to the story . . . Don't be afraid to jump on now and work your way back." "Victor Hugo and Honoré de Balzac both wrote about him [Vidocq] and now Pintoff has put her own spin on his legend." "Pintoff's writing is tight, controlled and rocket-fast. ... The psychological insights into characters and motives, the story of political jockeying within the police ranks, and the plotline breaks to insert dossiers on the Vidocq crime fighting team and news bulletins about a city on edge meld seamlessly into a thrilling, suspenseful, nail-biter of a story." "A very potent and captivating thriller ... It is a book in colour: the parade scenes seem lit up, the characters each have their own hue and there is not a touch of beige in sight." "[T]he perfect mystery to curl up with."